Nithilan is thrilled about his directorial debut, Kurangu Bommai, and having been able to rope in talented actors like Vidharth and Bharathirajaa. “What happens when many lives--that of two elderly friends, a father-son duo, some opportunists, and a person who’ll do anything for a family--intersect? 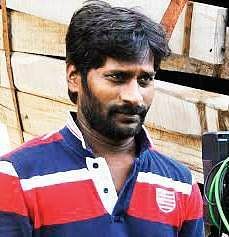 That’s the gist of Kurangu Bommai,” says the filmmaker, who claims the monkey in his title symbolises a person’s heart that constantly yearns. Nithilan chose Vidharth because he needed an actor “who could portray the character realistically. The director says Elango Kumaravel is an excellent method actor. “While he’s known mainly for Abhiyum Naanum, Kurangu Bommai will prove to be a turning point in his career.” The film also features a number of supporting artistes who will be playing interesting characters. Kurangu Bommai also marks the Tamil debut of Ajaneesh Loknath, who is known for his work in the Kannada film industry. NS Uthaya Kumar of Metro fame is the cinematographer, while Abhinav Sunder Nayak who edited Uriyadi, Vaayai Moodi Pesavum and Godha is also on board. With the audio launched last Sunday, Kurangu Bommai is set for release in July.